One of two delightful cottages nestled on the edge of the pretty village of Upton St Leonards. The perfect base for exploring the beautiful Cotswolds and the many wonderful attractions that this area has to offer. 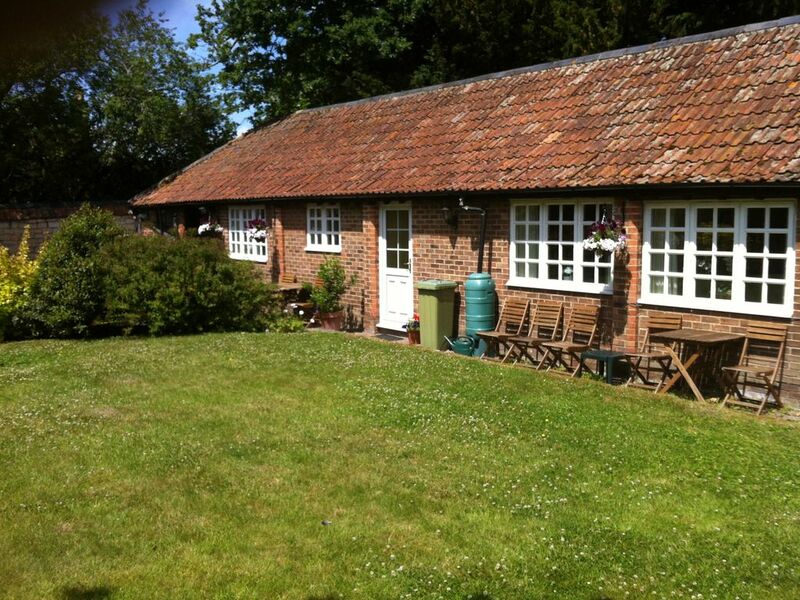 We offer two adjacent, single storey cottages which are fully equipped and self-contained. This cottage sleeps four guests in a double bedroom, plus a twin bedroom, with a separate shower room/WC. Quality white cotton bed linen and towels are included. Electricity and Wi-Fi is also included in the rental price. Both cottages feature an open-plan living room with kitchen and dining areas. Garden furniture is provided for sitting outside in fine weather. Automated gates ensure privacy and security and guests have independent access via a clicker with their cottage keys. Ample parking within the grounds. Convenient location for Gloucester, Cheltenham, Stroud, Painswick - central location ideal for touring the Cotswolds in general. Within walking distance of a bus stop, village shop, pub and children's playground. Gloucester railway station is approximately 3 miles and Stagecoach bus route 2/2A connects to it easily. We are a family of four and we bought Little Court and its cottages in 2006. We live here all the time and my husband grew up in this area. We have welcomed some delightful guests in our first 10 years. We enjoy meeting new people and we are very used to having guests. We aim to provide a warm welcome and we are happy to answer any questions or to provide local knowledge. However, we do not intrude on your privacy in any way and our cottages are completely self-contained. Equally, they are not isolated and there is always someone close by, but only if and when required. Little Court Cottages are the perfect option for people visiting Gloucestershire for a holiday or for those who need to be based in this area on a temporary basis for business. A hotel may be fun for a couple of days, but as any seasoned traveller knows well, that novelty soon begins to wear thin. For a temporary stay which necessitates more than just a couple of days away, Little Court Cottages offer you the comforts of a home away from home. Our cottages are self-contained and single storey. Both cottages are fully equipped and provide all the facilities required to make your stay as pleasant as possible. We have two cottages; one which sleeps 4 guests and another which sleeps 2 guests. Both have an open-plan sitting room with kitchen and dining areas. The larger cottage has two bedrooms (1 double plus a twin) with a separate shower room/WC. The smaller cottage has a double bedroom with an en-suite shower room/WC. The cottages are adjacent to each other, but otherwise completely separate. We have designed our cottages to offer the things which a hotel might not. Our location is convenient for both the M5 and the M4. We are an easy drive from Gloucester, Cheltenham, Stroud or Cirencester. We provide our guests with a secure base while they are away from home, tailored to suit the needs of the holidaymaker or the business user. We have recently installed a high speed broadband link and there is free Wi-Fi internet access in the cottages – bring your laptop and keep in touch. Little Court Cottages are within walking distance of a quiet, friendly pub serving good food and a village shop/post office; there are also several large supermarkets locally. Therefore, it is easy to self-cater – if you prefer, we can even stock the fridge/freezer in advance of your arrival by arrangement. This is particularly useful for people who have special dietary requirements. Little Court Cottages are a hidden gem! We have a fantastic location, nestled on the edge of the charming village of Upton St Leonards, which offers a secluded, rural setting within our secure and private grounds. However, we are only 3 miles from Gloucester city centre, 8 miles from Cheltenham and an easy strike to many of the other wonderful attractions on offer in the beautiful Cotswolds. Fully tiled shower room with full-size, walk-in shower cubicle. WC and hand basin and heated towel rail. Towels are provided for 4 guests. Duvets with quality white cotton bed linen is provided in all bedrooms. Changed weekly. Full-size washing machine in cottage and drying outside is available. Airer is provided. Full-size fridge/freezer with 3 freezer drawers. Fully equipped kitchen area and all crockery, glassware, cutlery and cooking equipment is provided. The cottage is single storey which may suit those with limited mobility. However, there are no specific modifications for disabled visitors and there are two steps into each cottage from level ground. I highly recommend this cottage. Booking process, arrival and departure were all simple and effective. The cottage itself is very comfortable, clean, well organised and equipped for living comfortably for a short period. Due partly to extreme weather we had some internet issues but these were resolved quickly. Thank you for this and we very much hope to see you again in the future. Merci aux propriétaires de ce charmant cottage. Ils sont tres gentils et tres accueillant. Ils ont la delicatesse de mettre quelques produits de base a disposition. Bien des locations en france devrait s inspirer de leur gentillesse et de l etat de propreté du logement. Rien a redire. Les enfants ont appréciés l exterieur balançoire... et ils ont meme eu la sympathie de mettre but et ballon a dispo si bien qu ils ne voulaient pas partir pour londres. Le charmant style anglais se retrouve dans cette location. Le pub familial en face est sympa aussi. La region est tres jolie a visiter. De nombreuses balades a pied sont a faire. Bref on a été agréablement surpris dela beauté de cette region. Bath et cardiff sont a1h de route environ mais ca vaut le detour. De nombreux musees et visites guidées gratuits . On a adoré la diversité des activités possibles depuis la location. Les produits de la ferme proche sont excellents. Une bonne adresse qui donne envie de revenir. Little Court Cottages are the perfect option for people visiting Gloucestershire for a holiday or for those who need to be based in this area on a temporary basis for business. A hotel may be fun for a couple of days, but as any seasoned traveller knows well, that novelty soon begins to wear thin. For a temporary stay which necessitates more than just a couple of days away, Little Court Cottages offer you the comforts of a home away from home. Our cottages are self-contained and single storey. Both cottages are fully equipped and provide all the facilities required to make your stay as pleasant as possible. We have two cottages; one which sleeps 4 guests and another which sleeps 2 guests. Both have an open-plan sitting room with kitchen and dining areas. The larger cottage has two bedrooms (1 double plus a twin) with a separate shower room/WC. The smaller cottage has a double bedroom with an en-suite shower room/WC. The cottages are adjacent to each other, but otherwise completely separate. We have designed our cottages to offer the things which a hotel might not. Our location is convenient for both the M5 and the M4. We are an easy drive from Gloucester, Cheltenham, Stroud or Cirencester. We provide our guests with a secure base while they are away from home, tailored to suit the needs of the holidaymaker or the business user. We have recently installed a high speed broadband link and there is free Wi-Fi internet access in the cottages – bring your laptop and keep in touch. Little Court Cottages are within walking distance of a quiet, friendly pub serving good food and a village shop/post office; there are also several large supermarkets locally. Therefore, it is easy to self-cater – if you prefer, we can even stock the fridge/freezer in advance of your arrival by arrangement. This is particularly useful for people who have special dietary requirements. If your visit necessitates more than one week in this location, guests may leave their possessions in their cottage even if they prefer to return home for the weekends. Alternatively, why not invite your partner or family to join you in Gloucestershire for a weekend in the country. Duvets with quality white cotton bed linen and towels are provided free. If your stay is for longer than one week, we can arrange for regular cleaning and linen change as required. Our automated entry system provides security and privacy – there is ample parking within our grounds and all guests have independent access via a clicker with their cottage keys. This is particularly important to lone female executives seconded to this area. As the cottages are in the grounds of the owners' Grade II listed home, you are equally not isolated – there is usually somebody around in case of a problem. Furthermore, this allows us to be flexible about your arrival and departure times. Deposit is non-refundable in the event of a cancellation. We recommend that you take out appropriate insurance.